AFTER five years of working in the conservation division of the Urban Redevelopment Authority (URA), executive architect Kelvin Ang has grown accustomed to being accused of being ignorant or plain callous about the city’s heritage. Building owners and private-sector architects come up to us and complain that we don’t care, or they question why we are not conserving this or that district or building – just because they see us as government people. They could not be more wrong about Mr Ang, however. The 34-year-old lives in a conserved pre-World War II flat in Tiong Bahru. At work, he also lives and breathes heritage, researching buildings and districts for their architectural rarity, and importance to the social history and identity of their locality. In his spare time, he writes articles on heritage for magazines and records the stories of old residents of conserved areas like his own Tiong Bahru estate. Now, he is rallying newer residents of the 1930s Art Deco-style blocks to run a newsletter and heritage tour of the housing estate. In the past few months, about 12 of them have had meetings in his flat and things should get off the ground by later this year, says Mr Ang. They have also been talking to older and some former residents, who are also keen to get involved, he adds. Mr Ang’s own favourite spots will certainly be on the walking tour: the Tiong Bahru market, which was reopened last month after a $16.8 million facelift, and the famed bird corner which is slated to be reinstated after closing in 2000 for redevelopment. He also hopes to find volunteers to record the oral histories of older residents in the area, because a place is characterised by its community, he says. As a child, he lived in Queensway but made regular visits to his mother’s old home in Chinatown. This architect believes in looking beyond the bricks and mortar, to celebrate ‘everyday culture’ – the life in the wet markets and community spaces, and of local festivals. ‘I get upset when people say there is nothing to see or do in Singapore. We are so blase about our environment, but there is so much diverse culture and history,’ says Mr Ang, who spent six years studying architecture in London. It is the emotional attachment to a place that increasingly mobile Singaporeans need to feel, he notes. ‘One can’t love a city in the abstract. It’s about where you grew up, where you went to school… It’s important that we are still able to see it, touch it. ‘Putting on his conservation architect hat, Mr Ang sees no conflict between conservation and progress. ‘We’ve always managed to have the best of both or many worlds here. That conservation issues stir much debate here is a good thing, he says, as he recalls the uproar over the restoration of Chinatown and the demolition of the old red-brick National Library building in Stamford Road. This exclusive luxury water-edge condominium is seated regally at the northern gateway to Sentosa Cove. The Oceanfront which resembles a shimmering sculpture will be the icon to captivate seafarers as they sail along the Singapore Straits to Sentosa Cove. The outstanding modern marine architectural design of The Oceanfront by internationally celebrated Wimberly Allison Tong & Goo Inc. will be the welcoming beacon for Sentosa Cove. Standing 15-storey tall, The Oceanfront will be the tallest residence in Sentosa Cove. Privileged residents enjoy not only the best views on the island, but also the incredible views of the immense sea and charming marina in this exclusive enclave. The Oceanfront @ Sentosa Cove is just steps away from the seafront and the first-class marina. The upcoming Quayside Village nearby is expected to house some of the trendiest restaurants and retail boutiques. The Oceanfront comprises five towers, 12 to 15 storeys high, each with a special curtain wall feature, exemplified by curve lines and planes that create a dynamic yet contemporary space. All 264 exquisitely designed apartments, ranging from spacious two-, three-, four-bedroom units to penthouses (Villas, Sky Suites and Sky Villas) feature full-height glass panels in the living and dining rooms to best take advantage of the magnificent waterfront views. All apartments will have a private lift lobby and most will include balconies. The early bird average price is set at $1,300 per square foot. Apart from lush landscaping and extensive water-features designed to enhance the views towards the sea and marina, residents can also enjoy the ocean views whilst swimming in the infinity pool and relaxing in the Jacuzzi. The various pools will appear as one body of water arcing across the development, where it dramatically looks like it is visually joining the sea. To optimise the views from the deck level to the surrounding vistas, the timber deck has been elevated which also ensures greater privacy for the residents. The Oceanfront @ Sentosa Cove is surrounded by a promenade, perfect for evening strolls and morning jogs, along the seafront and marina. Dine under the stars or shop at the glamorous boutiques at Quayside Village which is but a few minutes away via a pedestrian bridge. As part of the gated-community within Sentosa Cove, residents will also enjoy added amenities, security and privacy. On Sentosa Island, there is the widely anticipated multi-billion dollar Integrated Resort which promises a sophisticated mix of dining, shopping and entertainment options for all. How many toilets are there in these Tiong Bahru Flats? One and only….. irregardless of the size of the unit. 1) How much of my CPF savings can I withdraw to buy a property with remaining lease of less than 60 years but at least 30 years? You can use your Ordinary Account savings, and the future monthly CPF contributions in this account to buy the property and/ or to pay the monthly installments of the housing loan up to the applicable Withdrawal Limit (WL). The applicable WL is set at a level that covers the estimated depreciated value of the property when the member reaches the CPF withdrawal age of 55 years. It is calculated based on the ratio of the remaining lease when the member is 55 years old, to the lease at the point of purchase. Valuation Limit is the lower of the purchase price or the value of the property at the time of purchase. For details of applicable WL, please refer to the above table. 2) I am 30 years old and I wish to buy a private property which has a remaining lease of 59 years and 11 months.Would I be eligible to withdraw my CPF savings up to 100% of valuation limit? No. 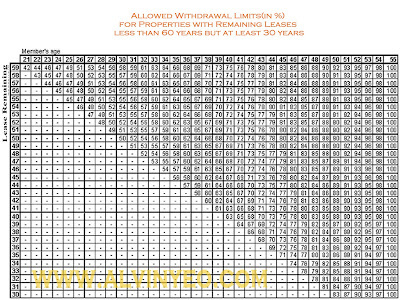 As the property has a remaining lease of less than 60 years, a lower withdrawal limit will be applicable for your case. Based on the property remaining lease of 59 years and your age of 30 years, you may withdraw up to 58% of the valuation limit for the property. Once this limit is reached, you cannot withdraw more CPF savings for the property. 3) I am now 40 years old. Can I buy a property with a remaining lease of 30 years? No. You cannot use your CPF to buy this property as the remaining lease of 30 years will not last you till 80 years old. You are currently browsing the Tiong Bahru Estate blog archives for July, 2006.